New York, NY - May 7, 2014 - Attorney General Eric T. Schneiderman and Comptroller Thomas DiNapoli today announced the indictment of New York City Council Member Ruben Wills for allegedly pocketing both public campaign funds and charitable grant money for personal benefit. Mr. Wills and a member of his family that he enlisted as a co-conspirator have been indicted by a Queens grand jury after an investigation exposed the theft of approximately $30,000 and a subsequent attempt by the Councilman to cover their tracks. The documents made public today detail a calculated scheme to defraud New York taxpayers while lining the Councilman’s own pockets. Wills is accused of stealing from two government agencies: the New York City Campaign Finance Board (“CFB”) and the New York State Office of Children and Family Services (“OCFS”). In the 2009 campaign for the City Council seat he now holds, Wills received matching funds from the CFB. Rather than spending the funds on legitimate campaign expenditures as required by law, Wills allegedly had his campaign committee pay $11,500 to Micro Targeting, a shell company created for the purported translation and distribution of campaign literature. But Micro Targeting never provided those services. Rather, according to documents made public in court today, Councilman Wills had a relative, Jelani Mills, redirect the money from Micro Targeting to NY 4 Life, a non-profit corporation Wills controlled, while falsely representing to the CFB that the money had been spent on qualified campaign expenditures. Wills then withdrew the money in the NY 4 Life bank account in a series of cash withdrawals and personal purchases. For example, he used NY 4 Life funds in the purchase of a $750 Louis Vuitton handbag he bought at Macy’s. According to today’s court filings, NY 4 Life figured prominently in the theft from OCFS, as well. This part of the scheme involved $33,000 in state funds provided to NY 4 Life via a grant earmarked by former State Senator Shirley Huntley while Wills was serving as Huntley’s chief of staff. To obtain that money, NY 4 Life signed a contract with OCFS, promising to conduct four public service projects. Instead, NY 4 Life allegedly conducted just one program that cost approximately $14,000, and Wills kept the remaining $19,000 in grant funds and used it for both political and personal expenses, including purchases at Nordstrom’s and Century 21 department stores. In addition, he made large cash withdrawals from the NY 4 Life account and used grant funds to issue checks to individuals who did little or no work related to the OCFS contract. Wills then concealed the theft by falsely identifying certain expenditures as relating to OCFS programs, which NY 4 Life had not conducted, and refused to account for the missing money, according to today’s allegations. "This City Councilman, instead of working for the public good, stole from the public coffers, according to the charges,” said Mark G. Peters, Commissioner of the New York City Department of Investigation. “DOI shared its expert knowledge on nonprofit fraud as part of this investigation and will continue to work with the State Attorney General and its law enforcement partners to put an end to this type of public corruption." “The thousands of public dollars stolen, allegedly at the hands of a public official, not only victimized some of our most vulnerable citizens, but the taxpayers who put their trust in someone elected to represent them," said Sheila J. Poole, Acting Commissioner for OCFS. "I commend the Attorney General for safeguarding taxpayer money, bringing to justice those who prey on the public, and protecting the best interests of children and families of this state." The indictment charges Ruben Wills with Grand Larceny in the Third Degree, Scheme to Defraud in the First Degree, Falsifying Business Records in the First Degree and Offering a False Instrument for Filing in the First Degree. If convicted of the top charge of Grand Larceny, he faces a maximum of seven years in prison. The same indictment charges Jelani Mills with Grand Larceny in the Third Degree and Falsifying Business Records in the First Degree. If convicted of the Grand Larceny charge, he faces at least two years in prison and a maximum of seven years. The investigation was handled by Investigators Gerard Matheson and Angel LaPorte. Also assisting in the investigation were Analyst KerryAnn Rodriguez and Investigative Analyst Brian Selfon. The Attorney General’s Investigations Bureau is led by Chief Investigator Dominick Zarrella. Assistant Attorneys General Jerrold L. Steigman and Rachel Doft, of the Public Integrity Bureau, are prosecuting the case. The Bureau is led by Deputy Bureau Chief Stacy Aronowitz and Bureau Chief Daniel G. Cort. The Attorney General's Criminal Justice Division is led by Executive Deputy Attorney General Kelly Donovan. The joint investigation was conducted with the Comptroller’s Investigations Unit and Bureau of State Expenditures. The Attorney General would like to thank the New York City Department of Investigation, the New York City Campaign Finance Board and the New York State Office of Children and Family Services for their assistance with the investigation. 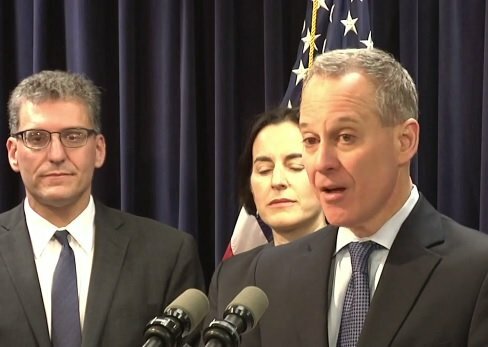 Subject: LongIsland.com - Your Name sent you Article details of "AG Schneiderman & Comptroller DiNapoli Announce Indictment of NYC Councilman Ruben Wills in Public Corruption Scheme"